At the UCL School of Management we do Executive Education differently. The School is focused on creating disruptive research and entrepreneurial leaders for the complex, interconnected world of the future. Unlike most business schools, we focus on Technology, Innovation, Entrepreneurship, and Analytics, which we believe are the major drivers of change in management practice. We work closely with our clients to produce tailored high impact programmes aligned to your organisation’s values, culture, situation, and objectives. Taking the time to understand how your organisation works helps us collaboratively develop the right solution for you. 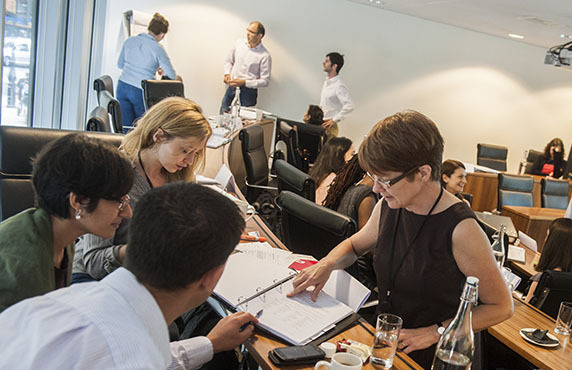 The underlining principle of our bespoke programmes is to create impact by translating our world-class research and knowledge of cutting-edge management practices into actionable insight that can be rapidly deployed within your organisation. Our research was rated as “world-leading” in the Research Excellence Framework 2014 (REF), with the highest percentage of world-leading (4*) research of any business school in the UK. All our programmes are underpinned by our deep understanding of people and organisations. We believe that behaviour change is at the heart of designing high impact Executive Education programmes that creates value and delivers measureable results. We focus on the key behaviours that drive performance, enable participants to learn and practice these new behaviours, and provide systems and frameworks to reinforce and support these changes. The School is very selective about the projects it takes on, and prefers to work with organisations where there is a strong cultural fit, and where there is an opportunity to deliver significant, measureable results. Custom programmes can be delivered in London or world-wide. If you have a problem where our knowledge and expertise could help, please get in touch: mgmt.execed@ucl.ac.uk.